AUSTIN, Texas (AP) — Two package bomb blasts a few miles apart killed a teenager and wounded two women in Austin on Monday, less than two weeks after a similar attack left a man dead in another part of the Texas capital. The first of Monday’s attacks killed a 17-year-old boy and wounded a 40-year-old woman, both of them black. 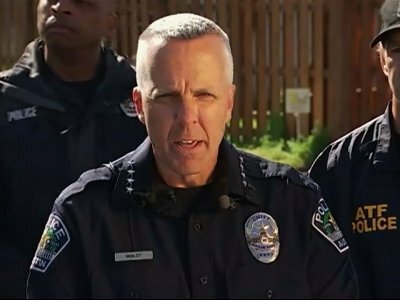 As Police Chief Brian Manley held a news conference to discuss that attack, authorities were called to the scene of another explosion that injured a 75-year-old Hispanic woman. She was taken to a hospital with potentially life-threatening wounds. Authorities suspect that both of Monday’s explosions were linked to a March 2 attack that killed a 39-year-old black man. All three blasts happened as the packages were opened, and officials urged the public to call police if they receive any unexpected packages. “This is the third in what we believe to be related incidents over the past 10 days,” Manley said while briefing reporters near the site of Monday’s second explosion. He at first suggested that the blasts could constitute a hate crime, but later amended that to say authorities had not settled on a motive. In a tweet, organizers of the festival said “SXSW is heartbroken by the explosions in Austin,” and they urged visitors to stay safe. Gov. Greg Abbott offered a $15,000 reward for information leading to an arrest. Monday’s first blast happened at a home in Springdale Hills, a leafy neighborhood of houses mostly from the 1960s and 1970s. After the attack, officials in hazardous materials suits came and went regularly. That was about 12 miles (20 kilometers) from the home where the March 2 package bomb killed 39-year-old Anthony Stephan House. House’s death was initially investigated as suspicious but is now viewed as a homicide. Monday’s second explosion occurred around the Montopolis neighborhood, about 5 miles south of the day’s first blast. “There was a horrible screaming. You knew that something terrible was happening,” Reynolds said, adding that the victim’s body was riddled with holes as emergency responders took her out of the house and into an ambulance. “Under no circumstances should you touch them, move them or handle them in any way,” he said. The victims in Monday’s blasts were not immediately identified.